Pub in Kensington, tucked away on a residential square just off Kensington High Street, which has been taken over by Fuller's. The interior is traditional without being old-fashioned photo of the bar, photo of some of the seating. They also have a separate restaurant area. Kake visited on a Monday early evening in September 2008. 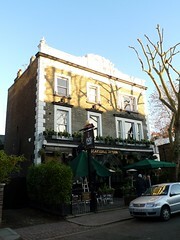 Their four handpumps had Broadside, Bombardier (£3.05/pint), Young's Bitter (£2.75/pint), and London Pride. According to the 2009 Good Beer Guide, the Pride is their regular beer and the others are guests. I had the Young's, and it was fine, though if I were being picky I'd say the pint I'd just had in the Britannia was very slightly better. For the gin-drinkers, I saw a small board advertising Bombay Sapphire with Fentimans tonic for £4.50. When I asked for a glass of tap water, I was pointed at the jug of iced tap water and array of glasses that had been left on the side of the bar for people to help themselves. It was nice and peaceful when I arrived around 5:15pm, with just a couple of other customers and some (vocal) jazz playing in the background, but by 6pm it had started to fill up, though there were still plenty of tables free. There's a flatscreen TV, which was showing the Paralympics during my visit but with the sound off except for a couple of minutes while the barstaff were fiddling with it. I heard the barman tell someone that the restaurant menu would start at 6pm, but they also have a bar menu which is served all day. A board on the wall gave the bar menu times as noon-10pm Mon-Sat and noon-9:30pm Sun. The bar menu doesn't just have snacks on it - it's a full menu ranging from starters/small food (e.g. soup of the day with ciabatta, £4.50) up to pie (beef and Bombardier, £11). There's a patio out the front, with several tables covered with large umbrellas; according to the 2009 Good Beer Guide this patio is heated. Last visited by Kake, 15 September 2008. Food times taken from blackboard in pub, September 2008. Opening times taken from the website, December 2009. Last edited 2013-05-10 08:00:21 (version 11; diff). List all versions. Page last edited 2013-05-10 08:00:21 (version 11).